Amilko is one of the few epic-level squirrels out there. He’s also a professional familiar, prone to simply attaching himself to a group – whether they like it or not – and somehow dragging them into the center of major events and disasters. After all, he’s a nexus and a catalyst for such things, and so he can use the help. Fortunately for him, his presence in a group provides some pretty impressive bonuses to make up for the trouble that he brings with him. Admittedly, they won’t all stack with each characters individual items – but their sheer variety ensures that there’s something for everyone. Personally, he’s a generalist. He’s got some arcane spellcasting, some clerical talents, some roguish tricks, and a few combat abilities (even if he does tend to under-rate them in comparison to – say – common housecats; after all, you never know when one of them might also turn out to be high-level!). Thus his role is – as usual for fifth characters – to cover for more specialized characters who aren’t there and to provide backup. Amilko was originally a Theran High Elf. He had a “Squirrel-Herald of Chaos” template applied before the game started – and picked up a version of the Half-Celestial Template considerably later on. Ergo, here we’ll have an example of stacking templates in Eclipse. First up, we have the basic Racial Template: a +1 ECL Theran High Elf. +4 Int, +2 Chr, -4 Str and -2 Con. That’s Attribute Shift taken three times, at a cost of 18 CP. +4 Wis. That’s 24 CP, even as part of a racial template. Three extra languages (3 CP). That’s 60 CP – a +1 ECL Race (just like all the other Theran races). Two levels of Shrinking. This included -4 Strength, +4 Dexterity, -2 Constitution, having no Reach, a +2 AC and Attack Modifier, and a +8 bonus to Balance, Climb, Hide, and Move Silently thanks to his minuscule weight. This was Specialized and Corrupted: while his small size did let him use his Dexterity for Climb and Jump checks instead of his strength, he could not use weapons and armor – or, indeed, most other gear, including most magical devices – unless it had been specially scaled down, made him an obviously-unique entity, and gave him all the problems of being a small animal (like hawks and cats). That reduced the cost to 8 CP. Mystical Duties as a Bringer of Chaos (providing +2 CP per level). A +4 Bonus to Balance and Jump. Of course, this was Specialized – leaving the character pretty much incapable of using Disguise, Forgery, Handle Animal, and Use Rope, reducing the cost to 4 CP. He also got squirrel instincts and extreme nosiness, but that was just par for the course anyway… That could be called a racial disadvantage or two, but it really isn’t necessary. That took him up to 62 CP. Still +1 ECL. Much later on, Amilko permanently bonded with a minor Celestial. The type of celestial didn’t matter; what mattered was that he became a living channel for celestial energies – a Half-Celestial. Of course, he already had some of those abilities, which cut the cost. On the other hand, the “gradual availability” modifier on the innate spells really didn’t mean much to a character who was already level eighteen or so. Universal Damage Reduction 5/-, Specialized for Double Effect (10)/Not versus magical weapons or versus fire, unholy, force, or sonic attacks. (12 CP). Immunity to Disease (Uncommon, Severe, Major, 6 CP). Resist/+4 to Saves versus Poison (6 CP). Defense/+1 Natural Armor, Specialized/Does not increase with level (3 CP). Spell Resistance II (10 + Level) (12 CP). Smite Evil 1/Day (Su, 1/Day, adds +Level/20 Max damage against an evil foe) (Smite, 6 CP). Self-Development: Str +4, Dex +2, Con +4, Int +2, Wis +4, Cha +4 at 6 CP per +1 (174 CP). These abilities were Specialized/ the user is considered a native outsider, must put up with a new and pushy “voice of conscience” that demands that he or she refrain from usual erratic behavior and acts of evil while pushing for unprofitable good deeds for charity, is an obvious beacon of holy power and a target for all kinds of evils, and can be affected by spells that affect celestials. This reduces the net cost to 109 CP. Amilko, thanks to his high attributes and Base Caster Level had access to clerical spell slots of up to level nine – and Spell-Like Abilities already work pretty much exactly like spells except for not needing components, which he had other ways to take care of. Ergo, all he needed was some bonus spell slots limited to the half-celestial spell types – in fact, three instances of Specialist (Half-Celestial Spells), with the Improved and Superior Modifiers, Specialized/Limited to the fixed half-celestial spell List (18 CP). L1) Protection from Evil x3. L2) Aid, Bless*, and Detect Evil*. L3) Cure Serious Wounds, Neutralize Poison, Remove Disease. *These spells are lower-level spells occupying higher level slots, albeit generally without any special benefit thereby. The “Daylight” spells use a built-in “Multiple” effect, providing a total of 25 uses. Now that was fairly cheap – simply because he ALREADY had the ability to cast ninth-level clerical spells. If he hadn’t, and he’d had to buy those abilities directly, that would have been another 30 CP – even presuming it was lumped in with the other specialized powers – and a +6 ECL modifier. In theory, he should also have purchased the ability to have his natural weapons count as magical weapons. On the other hand, it hardly seemed worth worrying about a squirrel’s natural weapons, so he skipped that bit. That gives the package a net cost of 127 CP – raising his total racial and template costs to 189 CP, or +5 ECL. Amilko based most of his abilities on building up absolutely appalling attributes, simply because it was funny to have the astounding squirrel running around. Ergo, he invested massively in attribute boosts – whether inherent, enhancement, or chaos (see below) based. Amilko currently speaks 16 languages – Common, three for his race, ten for his current base intelligence modifier, and two for his skill point expenditures. These include Elven, Draconic, Sylvan, Avian, Bestial (Mammalian), Celestial, Dwarven, Undercommon, Goblin, Abyssal, Infernal, Auran, Ignan, Primordial (the “Ancient Tongue”), and Latin. Available CP: 528 (level 21 base) + 42 (Duties as the Herald of Chaos) + 42 (Fast Learner, for Base Caster Level only) + 42 (Restrictions; Amilko is permanently stuck as a squirrel. Even polymorph effects, wishes, miracles, and transformation rituals will revert back to squirrel in short order. He also has serious legal problems, finds it very hard to be taken seriously, and is usually regarded as a pet) + 10 (Disadvantages; Accursed/”Use Magic Device” tends to function as “Cause Magical Accident” for him. Valuable/he’s the key to the lost city of Dun Ishara and the Chaos Orb. Compulsive/he takes up a role as a familiar, and adopts someone as his master when he joins a party) + 48 (eight level-based bonus feats) +35 (Unique Training – an acquired mental imprint from a master artificer, from the Secret Service of the Dragon Empire, and from several other sources) = 747 CP. Warcraft/BAB +11 (66 CP) (Effectively +21 due to Divine Power). Saves Note: +2 versus Enchantment Spells and Effects (Racial), +4 Versus Poison (Racial). Hit Dice: 3d6 (6 CP) + 12d8 (48 CP) + 6d4 (0 CP): Total 106 (Rolled) + 252 (21 x Con Mod 12) + 151 (55 + 8x Con Mod due to magic) = 509 HP. Armor Class: 10 +6 (Natural) +2 (Size) +12 (Dex) +17 (Wis) +8 (Chaos) +6 (Shield) +8 (Armor) +5 (Defender Dagger) = 74 (Touch 54). Tiny Adamantine Longsword (OK, so most people would call it a “sewing needle”. ): +32/+27/+22/+17 (+21 effective BAB +7 Strength +2 Magic +2 Size), 1d3+2 Magic+4d6 (Flaming, Shock, Frost, Force) +1d6 (Sneak Attack), Crit 19-20/x2. Ghost Touch weapon. Tiny Adamantine Dagger (also known as a “pin”): +35/+30/+25/+20 (+21 effective BAB +7 Strength +5 Magic +2 Size), 1d3+5 (Magic) +1d6 (Merciful), Crit 19-20/x2 Ghost Touch Defender. Amilko usually holds this in his off-hand and lets it defend; he doesn’t normally try to fight with it and his “sword” since he’d take the usual -4/-8 penalties. Acorn Slingshot: +35/+35/+30/+25/+20 60′ Ranged Touch (+21 effective BAB +12 Dex +2 Magic +2 Size -2 Rapid Shot), 1d6 +2 (Magic) +7 (Strength) +4d6 (Flaming, Shock, Frost, and Force) +1d6 Sneak Attack (if applicable) Ghost Touch. All the powers in the Herald of Chaos package are both Corrupted and Specialized. They often have specific limitations of their own, and they all share the limitations of the Herald of Chaos; Amilko’s mere presence often awakens dormant magics and creatures. His activities tend to stir up random trouble, the use of these powers fairly often have truly bizarre side effects, and work best when he’s simply adding an element of randomness to a situation. He has an easily-detected bizarre and chaotic aura – and a wide variety of weird creatures either seek to oppose him or ask him to do things for them. Channeling: 3 + (4x Cha Mod) uses per day (10 CP) at +4 Intensity (2 CP) with Spell Conversion/4x Eighth Level Effects, Corrupted for Increased Effect/Controlling the effects requires a Will check (the more elaborate the effect produced, the more difficult the check; if he fails the check he will take 1d4 points of damage to a random attribute and cannot attempt to use that effect again for a full hour) (15 CP). Immunity/Dispelling, Antimagic, and Disjunction (Common, Minor, Legendary), Specialized/only applies to his internal abilities – Channeling and any Innate Enchantments – effectively converting them to Extraordinary Abilities (8 CP). Innate Enchantment/Absorption Variant (x3, 6 CP). May change bonus types to “Chaos” bonuses if he so desires when absorbing an item (+2 CP). The items must still be assigned to item slots. Note that, at the moment, he’s only absorbed two items. Major Privilege: Has access to the “Chaos” bonus type (2 CP). Action Hero/Stunts option (2 CP). Occult Sense/The Cosmic Cycle (and what he needs to do to keep it turning) (2 CP). Specific Knowledge/The Eye and Prophecy of Thoth (1 CP). Dispelling: “Turning” Lawful Creatures DC 18, Dispel Magic DC 14, Break Enchantment DC 18, Greater Dispelling DC 21. Disruption: Shattering DC 16, “Rusting” Grasp DC 18, 2D4/1D4 Attribute Damage DC 20. Breach Reality (Getting something to work which shouldn’t. Walking thru a wall DC 18, bypassing SR / DR for an attack DC 14, breaking a Wall Of Force DC 18, using a “cure light wounds” spell to reattach a limb / head within a few rounds of it being severed DC 16 /20, breaching an anti-magic or anti-psionic field DC 35 and releasing imprisoned spirits DC 30), using Polymorph effects to change the slot a magic item goes in DC 24. The DC of unspecified effects is up to the game master. As a rough guide, use DC (12 + twice the level of the spell be emulated) and add +5 if the target is distant or the effect seems to stretch the nature of the field. If it doesn’t fall under chaotic disruption at all, it’s not possible. The Word of Creation can be used to repel those attuned to Destruction (effectively “Turning” most Evil Outsiders), to heal, and to create new things. “Turning” (or Exorcizing) Evil Outsiders DC 15. Blessing Items DC 15: This allows the user to create holy water and so on. Healing: Cure Light Wounds DC 12, Cure Moderate Wounds DC 15, Cure Serious Wounds DC 18, Cure Critical Wounds DC 21, Heal DC 27, Raise The Dead DC 28, Resurrection DC 32, True Resurrection DC 35. Creation: Of mundane items up to 250 GP DC 18, +3 DC per additional 250 GP. Magical Transference can be used to reshape, repair, and enlarge or shrink, magic items. It’s usually fairly simple to simply change something’s physical form and/or the slot it uses. It wasn’t used often enough to determine many DC’s. Grand Transformation operates like True Polymorph, but with an instantaneous duration. It can also be used to bestow templates, change creatures species, and make various other modifications. It also wasn’t used often enough to determine many DC’s – although he did find that giving young elven girls the “were-squirrel” template was only DC 20. Mystic Link IV (8 CP) with Communications (+2 CP), Power Link (+2 CP), Identity Link (+2 CP), and Transferable (+4 CP). All Corrupted/the links require hours to set up, and only work on those he sees as being in his current party. Blessing III/may “share” three item slots (12 CP), with up to (Cha Mod +1) targets (+4 CP) and may share his successful saves with those in the immediate vicinity (+8 CP), all Corrupted/only works with those he has a current Mystic Link with. Spell Channeling: The “Easy” Metamagical Theorem (2 CP), with Glory (2 CP) and Blessing (2 CP), all Specialized and Corrupted: These only work to allow Amilko’s chosen companion / boss to spontaneously Quicken a spell three times per day. Path of the Dragon: Shaping (Specialized, only as a prerequisite, 3 CP), Dragonfire (Specialized, only as a prerequisite, 3 CP), Eye of the Dragon x2 (12 CP), Venom of the Dragon (6 CP). Reflex Training with +4 Bonus Uses (seven total), Actions-pre-day variant, Specialized in Releasing Spells (6 CP). Finesse/may use Dex Mod instead of Str Mod with Melee Touch Attacks (6 CP). Amilko was, in fact, a dabbler – relying on massive attribute bonuses, a high base caster level, and natural talent, rather than really dedicating himself to his studies. Ergo, here we have a somewhat cheesy build which relies on bonus spells – available thanks to that high BCL – rather than actual earned power. It fits in with the general structure of magic on Thera better this way anyway. Fast Learner, Specialized in Base Caster Level (for +2 CP/Level, 6 CP). Wizard Spellcasting 1 with no caster levels (11 CP). Clerical Spellcasting Package 1 with no caster levels (7 CP): Domains: Animal (May use Animal Friendship 1/ Day, Knowledge/nature is a class skill), Travel (Freedom Of Movement for one round per level per day, Wilderness Lore is a class skill). Deity Unknown. Spell Mastery with the Efficient, Rapid, and Spontaneous Modifiers plus Spell Pool (12 CP). This provides him with (Int Mod x2, total 32) Spells which he can use spontaneously and lets him pool his Wizard spells and Intelligence-Based bonus spells (3L0, 1L1, and Int Bonus Spells: 4/4/4/4/3/3/3/3/2 – total 128.5 Spell Levels), Specialized/cannot have more spells of any higher level than of any lower level, including level zero. L0) Detect Magic, Fiery Spark, Mending, and Prestidigitation. L1) Expeditious Retreat, Feather Fall, and Grease, and True Strike. L2) Invisibility, Pyrotechnics, and Spider Climb. L3) Haste, Major Image, and Thundersphere (as Fireball, but Electrical/Sonic). L4) Dimension Door, Rainbow Pattern, and Secure Shelter. L5) Prying Eyes, Seeming, and Wall of Force. L6) Anti-psionic Sphere, Disintegration, and Dispel Magic (Greater). L7) Limited Wish, Spell Turning, and Teleport (Greater). L8) Maze, Polymorph Any Object, and Screen. L9) Prismatic Sphere, Time Stop, and Wish. Spell Mastery with the Efficient, Rapid, and Spontaneous Modifiers plus Spell Pool (12 CP). This provides him with (Int Mod x2, total 32) Spells which he can use spontaneously and lets him pool his Cleric spells and Wisdom-Based bonus spells (3L0, 2L1, and Wis Bonus Spells: 5/4/4/4/4/3/3/3/3 – total 144.5 Spell Levels), Specialized/cannot have more spells of any higher level than of any lower level, including level zero. L0) Detect Poison, Light, Purify Food and Drink, and Detect Magic. L1) Cure Light Wounds, Doom, Endure Elements, and Obscuring Mist. L2) Hold Person, Moment of Insight (+20 Insight Bonus to a Skill Check), and Silence. L3) Cure Serious Wounds, Dispel Magic, and Protection from Energy. L4) Dimensional Anchor, Freedom of Movement, and Neutralize Poison. L5) Commune with Nature, Plane Shift, and True Seeing. L6) Find the Path, Heal, and Malediction (bestows seven curses at medium range). L7) Destruction, Regeneration, and Restoration (Greater). L8) Dimensional Lock, Earthquake, and Planar Ally (Greater). L9) Gate, Heal (Mass), and Shapechange. The Easy Metamagical Theorem with Glory (12 CP). Reflex Action, Three Action per Day variant, Specialized in Defensive Actions Only (3 CP). Create Item (Wondrous Items and Wands, 12 CP), with Harvest of Artifice (6 CP). Double Enthusiast, Corrupted and Specialized for Increased Effect/Item Creation Feats only (6 CP). Action Hero/Crafter Option, x2, once Specialized in Wondrous Items, once Specialized in Spell Storing Items (6 CP). Magician (Using Charisma-Based Bonus Spell Slots for Rune Magic; 3/3/3/2/2/2/2/1) (6 CP). Augment Attack/1d6 Sneak Attack (3 CP). Martial Arts/1d4 base damage in HTH, is always considered Armed (3 CP). Bonus Attack/Rapid Shot Version (6 CP). Reflex Action, Three Extra Actions per Day Variant (6 CP). Improved Augmented Bonus: Adds Wis Mod to Dex Mod when determining AC, Specialized/only works while unarmored and only lightly encumbered (6 CP). “Astounding Staff“: Leadership, Specialized/the user may gain many followers, pets, or servants, including dragons and other strange beings. Unfortunately, while such aides are extremely impressive, they are never of much actual use. One can be taken along on adventures, but won’t really help much for one reason or another (3 CP). Innate Enchantment (all level one, caster level one) (6 CP). Acorn Firing: He can fire acorns up to 60 feet without range penalty. This is compatible with both weapon enhancements – if placed on a slightshot or something – and feats. Acorn Mastery: When he attacks people with Acorns, they’re treated as Touch Attacks. Acorn Impact: When he hits people with acorns, they go fast enough to cause 1d6 damage. Adept/Concentration, Hide, Spellcraft, and Move Silently (6 CP). Shapechange, Specialized/can only temporarily assume the form of hybrid squirrel/elf, changing nothing in game terms except his appearance and weight (3 CP). Luck with +4 Bonus Uses, Specialized in Defensive Uses Only (6 CP). Skills: 115 Skill Points (115 CP) + 148 (Combined SP/Level bonuses over 21 levels) = 263 SP. All Skills: +5 Chaos, +6 Competence, +5 Luck. Sadly, that’s only +8 for Rune Magic Skills. -Alchemy +16 01 +33 A.K.A. ;”Mess With Dangerous Goop”. -Warding/Mastery +11 05 +24 Allowing spells of up to level six. Further Advancement: Amilko – favored by the powers of chaos as he is – will probably be picking up the ability to add a second attribute modifier – probably Intelligence – to his saving throws, probably as “Clever Defense” or something. Increasing his Base Caster Level, adding over-level-nine spell slots to up his power reserves, and adding more luck and special defenses is likely to take a priority as well. Base: 2,500,000 GP, with no single item worth more than 625,000 GP. Amilko normally wears/carries a vest, needle-sheaths, a tiny hammock, a warm handkerchief for a blanket, a small spool of heavy thread/Light String, assorted nuts, lots of acorns to shoot at his enemies, a tiny water bottle, 150 platinum bits (worth 1 GP each, but much lighter), an assortment of toys and bouncy rubber balls, and a thunderstone Yo-Yo with a long string. He DOESN’T normally carry a spell book; he usually simply consults his current “master” if he wants something that isn’t on the list he can manage spontaneously. *Now Innate Enchantments. They can be assigned to any item slot. All of Amilko’s magical items are – of course – especially made (or transformed via his own powers, however erratic those may be). 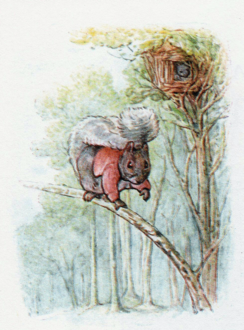 Normal items just aren’t suitable for a squirrel – which is why he’s been so reliant on his Crafting Points. Fortunately, he’s been able to trade – at least so far – for the items he can’t make personally. Handy Haversack (2000 GP). This does not require an item slot. Amulet Of Hands (QV The Practical Enchanter, 4000 GP, does not require an item slot). Hat of Disguise (1800 GP). Girdle of Adaption (as per the Necklace, 9000 GP). Merit Badge Sash: +6 Competence Bonus to All Skill and Attribute Checks (spell level four x caster level seven x 2000 GP = 56,000 GP, x Personal Only = 40,000 GP). Ring of Absolute Command: This exotic item reduces the XP cost of using the “Limited Wish” spell by 300 points (Unlimited-use of 300 XP, costs 30,000 XP and thus has a market price of 150,000 GP). Ring of Arcane Mastery: This ring provides a +4 bonus to the wearer’s Base Caster Level (The Focal Point, L5 x Caster Level 10 x 2000 GP x .7 Personal-Only = 70,000 GP). Prism Staff (with 30 charges, 196,000 GP): Caster Level 21, Prismatic Spray, Wall, and Sphere, all with Extended Duration, 1 Charge Each. Decanter of Endless Holy Water (35,000 GP). Five Sets of Quaals Feather Tokens – each consisting of one Anchor, Barred Door, Bird, Fan, Swan Boat, Tree, and Whip (10,000 GP Total). He loves these things. Bracers of Armor +8 (64,000 GP). Amilko’s personal weapons are very very small indeed; sewing needle and pin sized. Fortunately, they’re made of adamant. Needle-Longsword: +2, 1-3 base. Flaming, Shock, Frost, Force, and Ghost Touch (98,000 GP). Needle-Dagger: +5, Ghost Touch Merciful Defender (128,000 GP). Acorn Slingshot: +2. Flaming, Shock, Frost, Force, and Ghost Touch (98,000 GP). 10x Cure Light Wounds, Magic Weapon 4x Protection From Evil, Doom, Invisibility To Undead, Ventriloquism, Detect Secret Doors and Detect Undead. All at caster Level One, Spell Level One, 750 GP each, for a total of 15,000 GP. 2x Rope Trick, Hold Animal, Invisibility, Lesser Restoration, and Silence. All at Caster Level Three, Spell Level Two, 3000 GP each for a total of 18,000 GP. Composition: Writes 20 Pages/Charge, at +15. A level one effect at caster level one, 750 GP. Emotional Rain: Sprinkles a 40′ radius with colored water which gives everyone it touches a vague mood (cheerful, gloomy, etc). This has no real game effect (L1 x L1 again, 750 GP). Prismatic Duplicates: This works like “Mirror Image”, but you turn a random color and you get one copy of each of the remaining colors. Once someone finds you, it’s easy to tell who’s real (L1 x L1 again, 750 GP). Attention: Causes the user to glow brilliantly orange, and be the center of attention. (L1 x L1 again, 750 GP). Questing: Causes whatever creature it’s pointed at to hear someone who is authorized to give it orders telling it to go on some weird, random, mission. A successful Int check (normally against a DC of 11) will reveal that this is, in fact, simply a very minor charm. (L1 x L1 again, 750 GP). Amilko likes to keep things simple – which, to him, meant simply piling more and more enchantments onto a minimal number of items. Once he had them tricked out to his satisfaction, he simply used Innate Enchantment to absorb them – so that they couldn’t be readily taken away. He was quite pleased to find that, thanks to his position as the Herald of Chaos, there was no need to worry about having them dispelled or anything either. These are, of course two of the three item’s who’s effects he normally shares – providing an immense boost to any party he joins. +12 Bonus to All Attributes (+6 Chaos, +6 Enhancement). +19 Bonus to Armor Class (+5 Natural, +8 Chaos, +6 Shield). +18 Bonus to All Saves (+5 Chaos, +4 Luck, +5 Resistance, +4 Sacred). +5 Bonus to All Skills (+5 Chaos). +(55 + 8x Con Mod) HP. Amilko has provided his own inherent attribute bonuses by using his Action Hero/Crafting Points to create attribute-raising tomes. Admittedly, that’s six “huge projects”, and a cost of 90 points – but he’ll have had a lot more than that at this point. Burst Spheres consist of around 500 Lb of an appropriate fluid, held spherical in a short-term binding spell, then subjected to an “Item” spell, and then encased in glass to make them easier to handle. The net weight is about six ounces each. When they enter an antimagic field, however, they will burst out fairly violently – which is why Amilko normally keeps them in his Handy Haversack; the inter-dimensional space is inaccessible in an antimagic field, but not affected by one; ergo there won’t be any accidents. Some of the fluids he has in stock include a mixture of Pitch, Oil, and Alchemists Fire, some Green Slime, Acid, Holy Water, a Gibbering Mouther (via Polymorph), a Black Pudding (via Polymorph), Molten Lead, and Water. Fiery Spark; Transmutation L0, Components S, Casting Time 1 Action, Range Long (400′ + 40 / Level) Duration One Round, Saving Throw Reflex Negates and Spell Resistance No. This spell ignites and hurls a bit of pitch or similar material. This is capable of inflicting 1 point of damage on a direct hit, and of setting fire to easily-ignited materials (Twigs, Paper, Leaves, etc. Such items may also save however). Sympathetic Strike; Necromancy, Sor/Wiz 3, Brd 4. Components S M (A pin and a wax doll), Casting Time 1 Action, Range Short, Target; 1 Simulacrum, Clone, or Person, Duration; 1D4+1 Rounds, Saving Throw Special (Fortitude), and Spell Resistance Yes. This deadly spell enhances the innate link between the life-energy of a clone/simulacrum and it’s creator (Or between a child and it’s parents – although this is definitely an evil thing to do), permitting the user to harm the true target(s) by harming that victim. During the duration of the spell, any harm inflicted on the “target” will also be inflicted on the true target – said creator/parent. A clone is the best target; They generally can’t resist, the true target saves at -6 for half effect, and various special injuries can be created by maiming the clone. Simulacrums are second-best targets; the true target gets to save normally, for half effect… Children are less useful; the target takes only 1/4’th damage – although the parent in question must make a save, or die themselves, if said child dies while the spell is in effect. Contingency Trigger; Illusion, Sor/Wiz L2, Brd 2, Components V S, Casting Time 1 Action, Range Medium, Target 1 Creature, Duration one action, Saving Throw None, and Spell Resistance Yes. This spell creates a simple illusion which affects the target’s magic items and contingent spells – if any. All such items will “sense” their trigger conditions. Command-Word and Use- Activated items will each activate once – and any contingent spells will go off. While this is very rarely all that dangerous, it’s often both inconvenient and expensive. Hurling; Transformation, Sor/Wiz 2, Components V S, Casting Time 1 Action, Range Long, Target One Lb/Level of assorted items, with a max of ten pounds, Saving Throw None, and Spell Resistance No. Hurling telekinetically hurls small items, whether within the caster’s possession or within his/ her immediate vicinity, at up to three chosen targets within range. A single roll to hit is made for all targets – although this may be a normal, ranged-touch, or basic targeting roll depending on the nature of the item(s). The base damage is one die per pound, The die and damage type depend on the material; Laundry does 1D4/Stun, Rocks 1D6/Normal, Pointy items – broken glass, daggers, etc – do D8/normal – and globs of magma might do a D12/fire. Once an item is “launched”, the caster has no further control; the trajectory is entirely mundane. So I noticed that the last bullet point on Amilko’s half-celestial template says that he’s paying 174 CP for his ability score bonuses, at 6 CP per +1 (Improved Self-Development at half-price due to being in a template). However, the listed ability modifiers (Str +4, Dex +2, Con +4, Int +2, Wis +4, Cha +4) only add up to a grand total of +20, which should cost just 120 CP. Now, 120 CP added to the other listed half-celestial abilities that Amilko’s paying for, and then halving them for being specialized, comes to 82 CP, or 27 CP less than the 109 CP that’s listed. That actually doesn’t change his total ECL, since that reduces the total cost of his racial and template abilities from 189 CP to 162, which is still a +5 ECL modifier. But it still leaves the question of where that extra 54 CP cost came from?